Morels with asparagus and cream (and bacon). This is a very good dish, but no need to avoid the obvious, this is not a particularly healthy dish. The photo says it all. 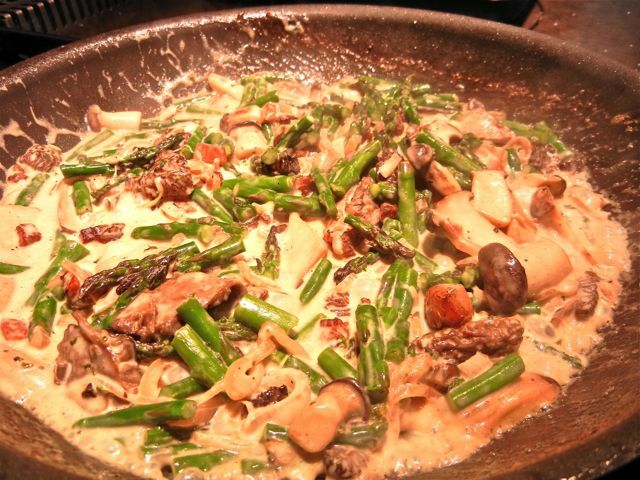 Morels and asparagus bathed in a sauce of cream and bacon. We do offer some notes on how to make a lighter version of the recipe, but we view morels as “special occasion” food around here. When we get them, we don’t hold back. We just love morels. And rather than try to explain the flavor profile in great detail, we will share a description from our eldest child; “ooh, morels, yum- they taste like meat”. Yup, they do. Rich, and indeed “meaty” in flavor, morels have a great texture when cooked and taste like the umami-bombs they are. Morels are from the Morchella genus of mushrooms and are common in the United States and enjoyed in Europe and Asia. Morels are found in many forest environments, but on the west coast the Gray Morels are most associated with wildfires. The morels thrive in forest areas after a burn and in areas of “controlled burns”. As controlled burns and wildfires are common throughout the west in most years, we get our share of morels. Most go to restaurants or are dried for sale, but we do get fresh morels at the farmers market- and when we do, we grab them. But even in good years they are not cheap. Dried morels are a more affordable (and off-season) substitute. Ingredients, note the mix of morels and king trumpet mushrooms. As for the morels themselves, they are usually 1-3 inches in size and have a unique “sponge-like” cap and a hollow core. This makes cleaning the morels a challenge. Frankly, morels are dirty, buggy mushrooms. And as they often come from pine forests, a few pine needles may be stuck in there as well. While it may sound like sacrilege to purists, we suggest that morels be cut in half and thoroughly rinsed in water. The water will cook out with some extra time in the pan, but no one likes mud, bugs and pine needles in their food. It is also a good idea to inspect and clean each morel by hand before you cook them. This is time-consuming work, but since morels will be a special treat for most, it is worth the extra effort. Now some will say that the morels should be served simply, with minimal additions, and that is great. 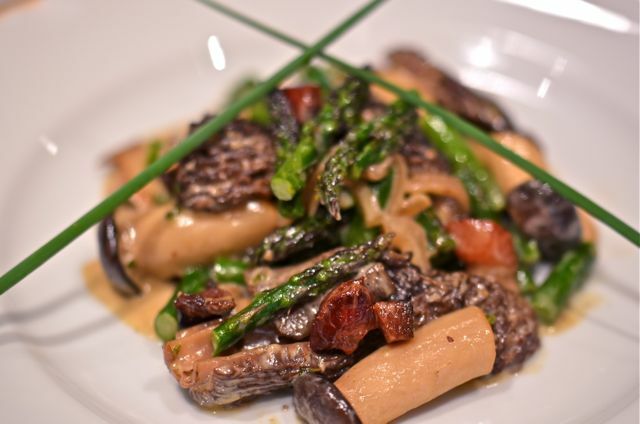 But the morels play very well with other flavors, particularly earthy, sweet green vegetables like asparagus (fiddleheads are also good, if you can get them). And why not add some home-cured bacon, a touch of shallot, cream and some fresh thyme? 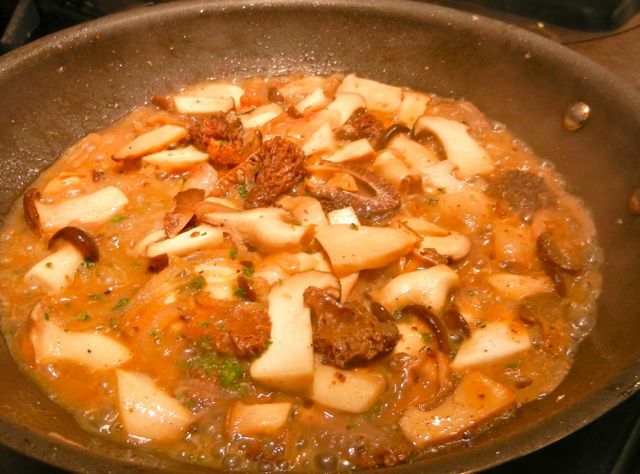 And morels are really expensive, so we add some other meaty mushrooms (we use king trumpets) to the recipe to as well. And in a pinch, you can just use other mushrooms altogether. The flavors will still be good. Wash the mushrooms, you will be much happier. Bacon adds extra flavor, but you can substitute olive oil. Reserve the bacon pieces, but cook the mushrooms in the bacon fat. Making this dish is a simple one-pan operation. Most of the work is in prep. 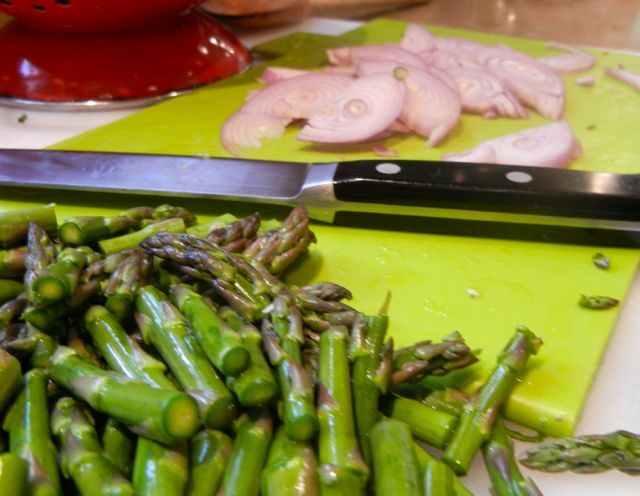 Clean and slice the mushrooms, asparagus and shallots and set aside. 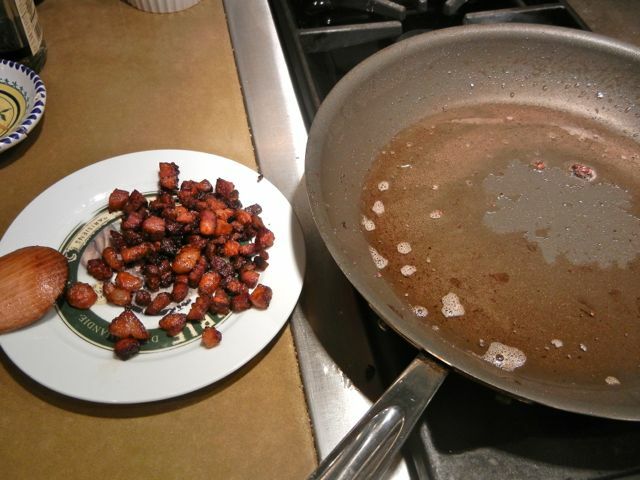 Cut some bacon into cubes or strips and brown, remove the bacon pieces and reserve, but keep the bacon fat in the pan. (You could skip the bacon and just use olive oil). Add the shallots and mushrooms and cook until they give up their liquid and it is mostly reduced. Add the thyme, then deglaze with some white wine and then add the asparagus. Cook the asparagus for a few minutes then add the cream, reduce for another minute, add the bacon and then check seasoning. Adjust seasoning as needed and serve. Cook the morels and shallots until they give up their liquid. Add and reduce the wine, then add the asparagus. Finish the dish with cream and add the bacon. While we often serve this recipe as a side, it is substantial enough to be the lead element in any dish. (For example, you can take this recipe and pour it over pasta, just add a 1/4 cup of pasta water to the sauce and toss with the pasta- it will rock). We served the morels with sous-vide halibut filets. The fish was perfectly cooked, but we had no illusions, it was just a light protein to go with the morels. And for all the other ingredients, the morels still shine in this dish. If you stumble across some morels- give this a try. You will get the full impact of a very tasty mushroom. Serve as a side or sauce for pasta. Or just eat it all yourself. You can substitute a package of dried morels for fresh. Juts follow the soaking instructions. Washing mushrooms still gives purists pain, but good writers like Harold McGee and Alton Brown have pretty well proven that there is little, if any, negative effect. 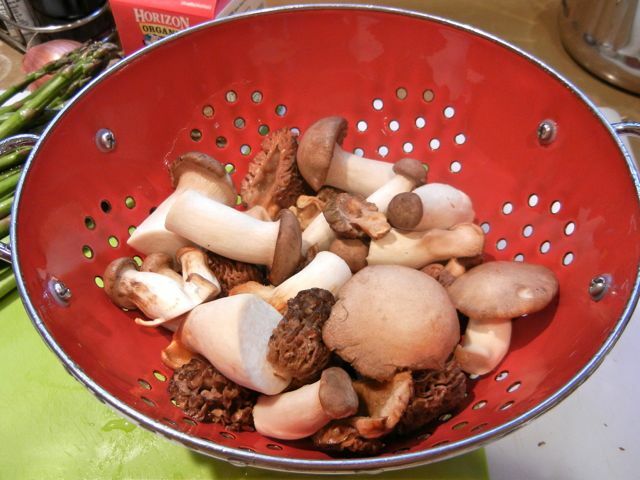 Washing is much more effective than brushing mushrooms to remove dirt. If you want a lighter or vegetarian version of the dish, simply omit the bacon and use 2-3 tablespoons of olive oil. 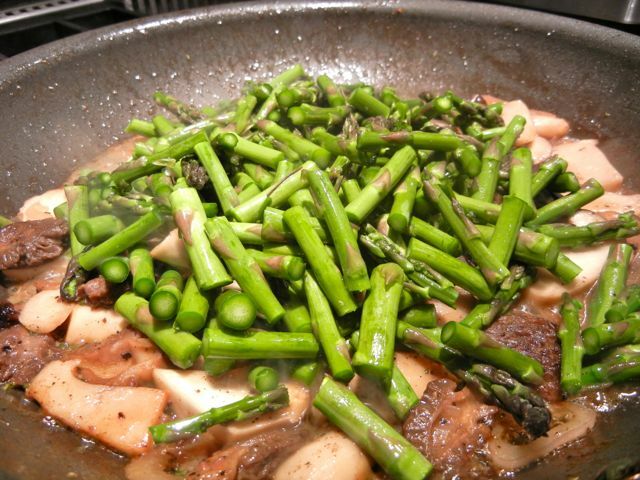 What You Get: Tasty, meaty and rich mushrooms complimented by earthy asparagus. How Long? 20-30 minutes, with about 20 minutes of active time. Must of the time is spent cleaning and slicing mushrooms. 1-2 cups (about 3/4 pound) of morel mushrooms, sliced in half and thoroughly cleaned. Clean and slice the mushrooms, asparagus and shallot. Set aside. Place a large skillet over medium heat. Place the bacon in the skillet and cook until brown, 4-5 minutes. 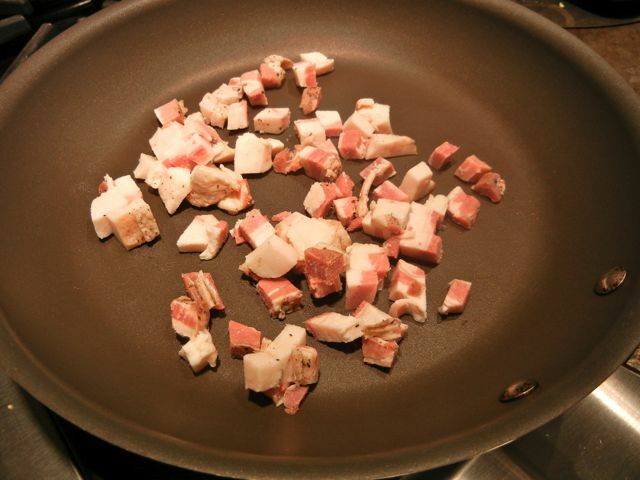 Remove the bacon from the pan and reserve for later, keep the bacon fat in the pan. Place the mushrooms and shallots in the pan and cook until the mushrooms give up their liquid and it is mostly reduced. About 10 minutes. Then add the wine and thyme and cook for another 1-2 minutes. Add the asparagus and cook until just a bit tender, 3-4 minutes. Add the heavy cream, stir and allow to reduce for another 2-3 minutes until the sauce thickens. Add in the bacon pieces, taste for seasoning. Add salt and pepper to taste and serve. This sounds wonderful! 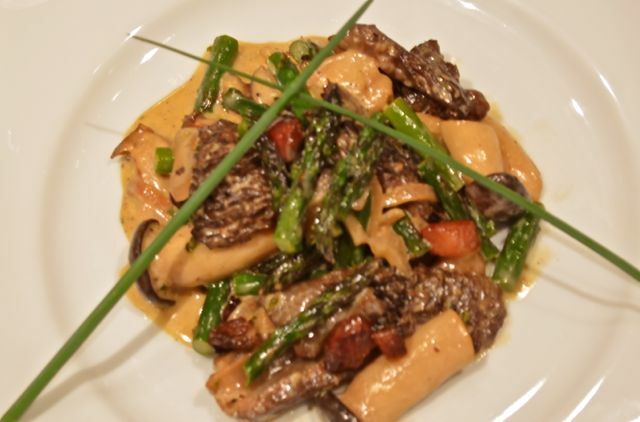 Morel mushrooms and asparagus shout “Spring” to me. Along with rhubarb, they are the first fresh flavors of the season here in northern Michigan. Thanks for a lovely recipe! This looks delicious! I love the way you take your pictures too! Morels were one of the contenders for our Creative Kitchen Challenge but didn’t make the cut (due to expense). I have kept them on the list for a “round two” and this might just be the perfect recipe to try them out!! This looks SO yum! It’s almost 11pm here and I want dinner time back (and some morels). 🙂 Thanks for sharing! I am SO very jealous right now. Morels grew wild in Missouri, but I haven’t come across any here in Texas. They are indescribably delicious. Thanks for reading. We agree on morels, one of the best things out there..
Lovely morels recipe. 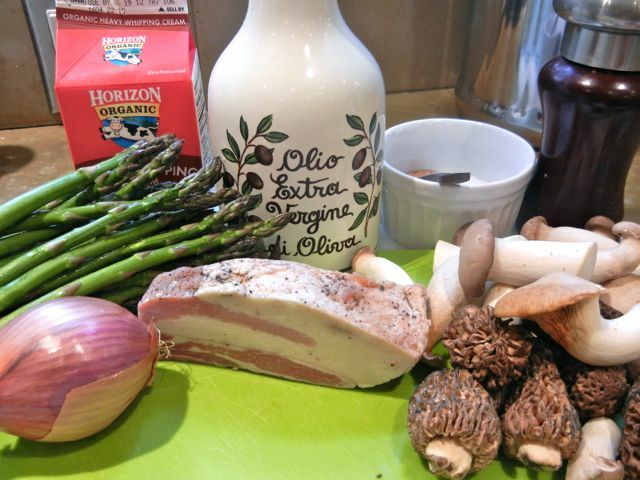 Bacon gives a nice touch to any mushroom and asparagus also. As you wrote can be either a side dish or even a pasta sauce or meat sauce also :). Heaven on a plate!! the only way to make bacon better is with Morels! (and more fat, and a token vegetable!!) love it!